2 former child brides just took their country to court — and won. A special Upworthy series about global health and poverty, made possible by the Bill & Melinda Gates Foundation. In Zimbabwe, a country where an estimated 31% of all girls are forced into marriage by the time they turn 18, something unprecedented just happened. Two former child brides led a successful campaign to get child marriage banned. Loveness Mudzuru and Ruvimbo Tsopodzi, who are just teenagers themselves, called on the Constitutional Court of Zimbabwe to declare existing child-marriage legislation unconstitutional. By the time they were 16, both Loveness and Ruvimbo were wives. Loveness had two kids by the time she turned 18 — an age when many teens are trying to finish high school and live that awkward teenage life. Having to drop out of school and grow up too fast, both girls knew there was more out there for them; it was just now out of their reach. Thankfully, she wasn’t the only one with that thought. The girls and their campaign against child marriage were backed by the human rights group ROOTS and legal think tank Veritas. And what a success effort it was: More girls will get to stay in school and have a say in their own futures now. 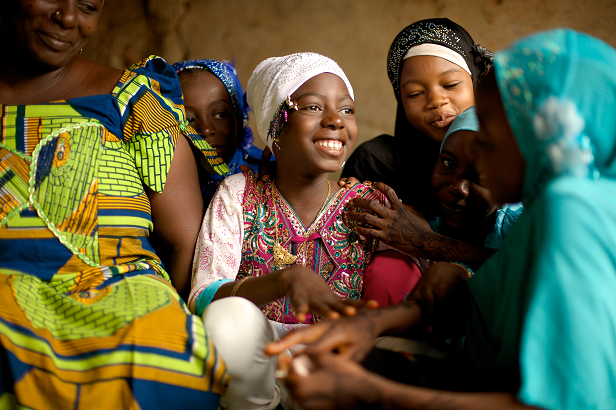 The cycle of poverty will lessen, and girls’ health outcomes will improve. After months of deliberation, the court ruled in the girls’ favor on Jan. 20, 2016. People in Zimbabwe will no longer be allowed to enter into any marriage, including customary law unions, before they turn 18 — regardless of their gender. It’s a remarkable moment led by two teens who’ve experienced the consequences of child marriage firsthand. If change happened because these girls spoke out, imagine what this can mean for girls in other countries where child marriage takes place. This decision isn’t just a big deal for Zimbabwe — it sets a standard for other African countries and for the rest of the world. Real talk: Every day, an additional 39,000 young girls worldwide find themselves forced into marriage. CARE’s report “Vows of Poverty” takes a close look at the 26 countries where girls are more likely to walk down the aisle than go to high school. It’s sobering but encouraging to see that with Loveness and Ruvimbo’s victory in Zimbabwe, there are signs that the tide is beginning to shift. Countries like Guatemala and Malawi have recently raised the minimum age for marriage, and Nepal and Zambia are developing national action plans to help girls avoid the practice. But the ultimate hurdle in any country is changing the cultural attitudes and perceptions that surround child marriage — and that takes time. Regardless, Zimbabwe is taking a big step forward by changing its outdated law. And what may just be the best part about it? It’s because two teens went up against their government and … won. THAT is kickass and a great reminder that your voice matters no matter where you live. Posted by Above Whispers on February 6, 2016.